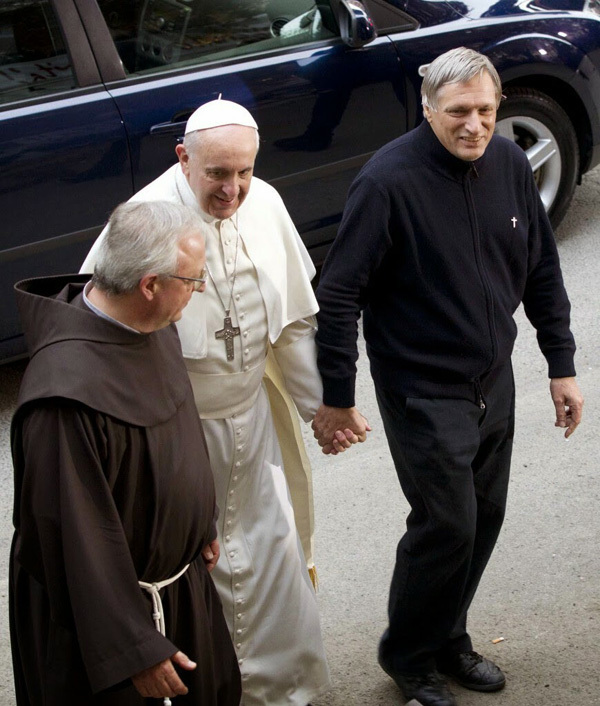 On March 21, 2014, Pope Francis visited St. Gregory VII parish in Rome, just outside the Vatican, and held hands with Fr. Luigi Ciotti, above. The official goal of the visit was to pay homage to victims of the Mafia at a meeting that included prayers and speeches. Ciotti is the founder of Libera, an organization to combat the wrongdoings of the Mafia. However, Ciotti is also a strong promoter of homosexuality and many other "social" causes that affiliate him with Communism, as was his great friend and mentor, Fr. Andrea Gallo, who passed away 10 months earlier. Incidentally, Gallo's funeral Mass, where Ciotti gave the panegyric, allowed free manifestation for homosexuals and communists (here). Thus, Francis' affection for Ciotti has two meanings: on one hand, it serves to express his discordance with the Mafia; on the other hand, and perhaps principally, it expresses his complacence with homosexuality and his approval of ecclesiastical support for Communism, which in the last 50 years has been the most efficient way to spread the ideas of Marx and Lenin. Below first row, Fr. Ciotti participates in a "gay parade." 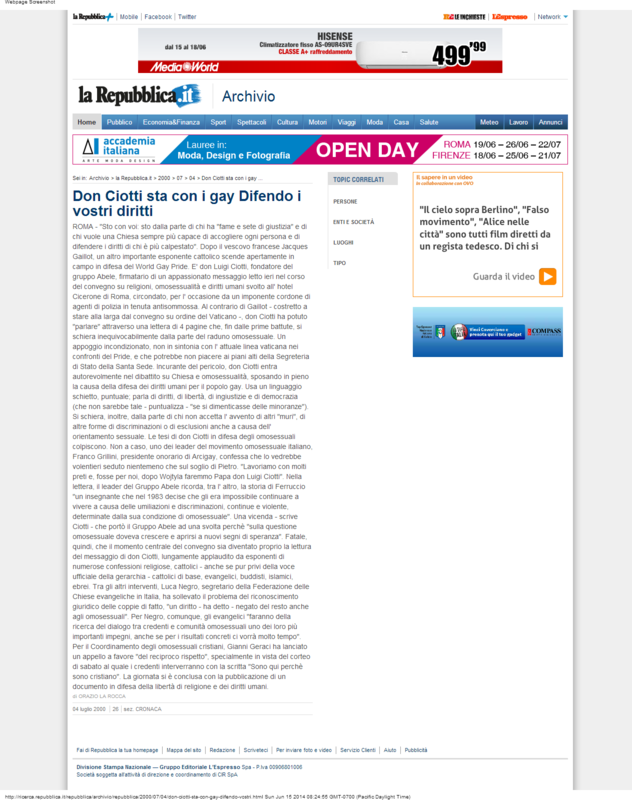 For more on his perfect agreement with this kind of homo manifestation and his approval of "gay marriage" and the adoption of children by homosexuals, please read here and here, two news reports in Italian . 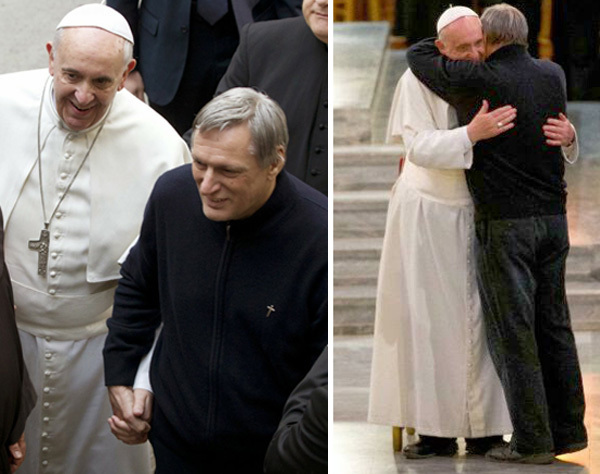 In the second row, an effusive embrace between Francis and Ciotti; third row, ebullient embraces between Andrea Gallo and Luigi Ciotti. These affectionate embraces are only possible between persons who share the same mentality and thinking. In the next two rows, more expressions of unreserved solidarity.